Garmisch-Partenkirchen, Germany – Lindsey Vonn is back on top. Starting bib 17, Vonn posted the fastest times at all five intermediate splits ahead of second-place finisher Lara Gut of Switzerland, 0.15 seconds back, and third-place finisher Viktoria Rebensburg of Germany, both of whom looked on with surprising disbelief in the finish at what Vonn had just accomplished. Despite a small mistake at the bottom of the course, Gut was pleased with her second-place result. “I’m pretty happy because I know I can be close to the win all the time if I ski the way I can,” Gut noted. The German crowd was awed by Rebensburg’s return to the downhill podium for the first time in a year, since the Garmisch-Partenkirchen race last season when she also finished third. Vonn’s victory led four Americans into the top 20, including Breezy Johnson (Victor, Idaho) in 11th; Laurenne Ross (Bend, Ore.) and Stacey Cook (Mammoth Lakes, Calif.) tied for 18th. Jackie Wiles (Aurora, Ore.), who grabbed her first career World Cup podium in third last weekend in Altenmarkt- Zauchensee, finished 26th. Leanne Smith (North Conway, N.H.) was 37th. Johnson was well on her way to a career-best World Cup result until the second-to-last racer to start, Ricarda Haaser of Austria, starting bib 53 came down and posted her career-best World Cup downhill finish in 10th. With her second-place finish, Gut took 80 points out of Mikaela Shiffrin’s (Eagle-Vail, CO) overall World Cup lead. 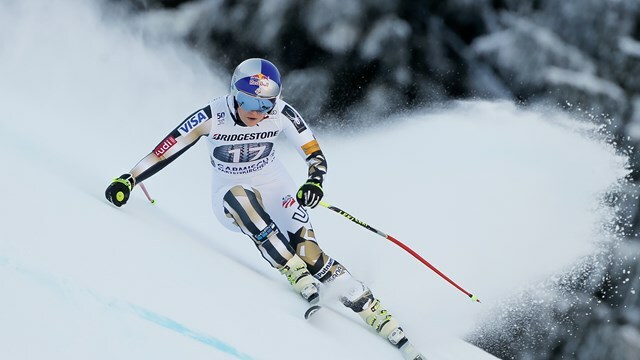 Shiffrin leads the overall standings with 1,008 points. Gut is second with 773 points. Slovenia’s Ilka Stuhec finished seventh to maintain her overall World Cup downhill lead over Gut in second and Italy’s Sofia Goggia in third. Up next, the women race super G Sunday in Garmisch-Partenkirchen.